Hey everyone! 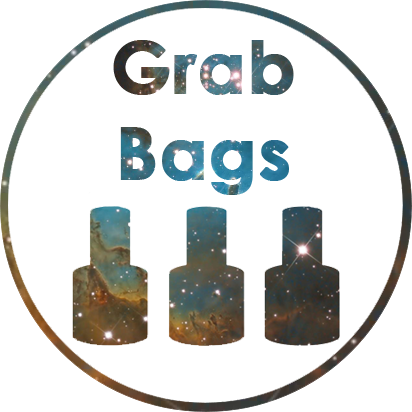 It's time for me to do some spring cleaning, so I figured I would sell some grab bags to make it fun and interesting! I have lots of polishes that need new homes! Each grab bag will be mailed in a USPS small flat rate box. You will receive at least 5 full size polishes inside each one. 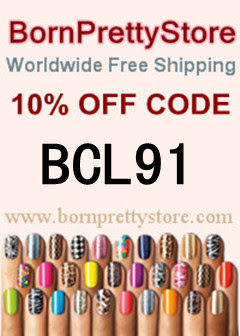 You may get a 6th full size polish, some mini polishes, and/or some nail art supplies too. I'll fit as many goodies in there as I can! Do you like glitter? Chunky glitter? What color polishes do you like most? Or which colors do you dislike? I am only selling grab bags to residents of the US, sorry! Please email me if you would like one, and then make a payment to me via Paypal with the "gift" option. If you do not feel comfortable using the "gift" option, please let me know via email to work out an actual invoice (PayPal fees applicable). Once the transaction is complete and I purchase/print your label, I will email you your USPS tracking number - all grab bags will have tracking information included. All sales are final, no returns and no refunds. I am not responsible for lost or damaged items, sorry! Happy Easter, to all those celebrating! And for everybody else, Happy Spring! Both Easter and springtime make me crave pastel colors and cute, dainty designs, so I tried to mix them together a bit without it being too bland. I used colors that are sort of light, springy, and pastel, but a bit brighter. I also wanted them to be a little darker so the white designs would contrast better as well. For my colors, I used Rainbow Honey Viola (purple), Tayabak (green), and Cymbidium (pink), along with China Glaze White on White for the designs. Viola is a bit less bluish-purple in person, and is a little brighter, but it's close in these photos! I wanted to do a bit of a sponge gradient, so I started by painted all of my nails purple with Viola. I then sponged on Tayabak with a makeup sponge, and when that way dry, I sponged on Cymbidium toward the tips. While the effect isn't exactly a gradient with my contrasting color choices, it almost looks like speckled or watercolored Easter eggs, so I like it! When the sponged colors were dry, I freehanded some white zigzags and also added some dots with a dotting tool. While the zigzags aren't as perfect as they would have been with decals, tape, or a stamp, I like it! I usually don't mind if the outcome is a little off, as long as it was fun to do! I haven't been doing too much nail art recently, so I thought I'd do some. It seems I don't have too much time to spend on nail art as much as I used to, nor have I been feeling as creative for new ideas. So while cherry blossom nails aren't exactly new for me, I thought I'd give them a go again. I normally think to do cherry blossom designs over white polish so that the pale pink blossoms show up easily. Also the dark branches tend to blend in with darker colors too much. But this time I decided to switch it up a bit and make the cherry blossoms over Rainbow Honey Wistful, which is a shimmery goldish-silver polish that has a pink sheen to it. Wistful is gorgeous on its own, but I love how the pinkish shine to it goes so well with the pink blossoms! I used Rainbow Honey Cymbidium for the darker pink, and Zoya Dot for the lighter pink. I also used Megan Miller Ganache for the branches. To achieve my cherry blossom look, I applied two coats of Wistful as my base. I then free handed the branches with a small nail art brush using Ganache. I love how they don't have to be perfectly straight lines since they're branches! I then took a medium sized dotting tool and made some dots where I wanted the larger blossoms with Cymbidium. I topped those blossoms with Dot to give them some contrast and also make some smaller buds. I love how they turned out! They're not perfect, but I think they're cute - and perfect for spring, too! I think using a shimmery metallic as the base worked out better than anticipated too. Now I have something else to use other than just white polish for a base. I have been addicted to Rainbow Honey polishes recently, but I just can't get enough of them! All of their new releases are just amazing. From their recent Midnight Garden collection, I used Charaxes topped with Diamond Dust as an accent, which was a monthly limited edition polish months ago. Charaxes is just a stunning shade of blue. I'm typically drawn to lots of blues and greens, so I have a lot of both. And while I have a lot of blue polishes, this one is very unique in my collection! The shade is deep, yet bright. Charaxes is a one coater polish. I was amazed with how well it applied and covered! It is very pigmented and applied super smooth. It also left no sheer spots so I didn't have to apply a second coat! Since I knew it was going to be pretty pigmented though, I did apply a couple coats of base coat just to be sure that I wouldn't get any staining from it. I also used Diamond Dust as an accent. I was tempted to put it over all nails, but I wanted to admire Charaxes on its own since it's just so beautiful. I think it turned out well though! Diamond Dust added a little sparkle and interest without taking too much away from Charaxes. Both Charaxes and Diamond Dust are still currently available from rainbowhoney.com for $10 each (full size). I was feeling in the mood for something bright and colorful on my nails, and I think I found the perfect solution! While spring just started not too long ago, I'm already itching for some bright summery colors. But I do love pastels, so I thought I'd mix the two together! I decided to go with China Glaze Highlight of My Summer as a base, which is one of my favorite polishes. I love this color because it's what I describe as a neon pastel. It's almost like a very bright mint, but in some light it's more yellow-toned and looked more neon green. Either way, it's bright and gorgeous! I also got a mini of a Rainbow Honey polish not too long ago called Poffin Party. This has since been released as a full size polish included in their limited edition set for the month of April. I'm so glad a full size is now available because it's amazing! It's filled with colorful glitter - mostly circles among some pink squares. I love this combination! Poffin Party almost reminds me of Funfetti cupcakes and sprinkles with the circular glitter. The circles are quite large and are green, yellow, orange, and pink. There are also some smaller circles in light blue and a light spring green. The base even has some shimmery flecks in it which made all of my nails look sparkly! Highlight of My Summer alone is just a creme with no shimmer.